Oct 26, 2018, the evening was all prepared to shed the goodness, good fortune over us. We clutched our seats tight, set up the bows for something for which we are all waiting to happen long before. All at once, our faces glowed after hearing, ‘CEDCOSS TECHNOLOGIES’ a name which ties all of us together in an unbreakable thread of dedication, loyalty, hard work, and culture. This Event was Deloitte’s Fast 50 India Award 2018 at Bangalore on 26th October 2018. And we nailed it. Utmost pleasured to announce that CEDCOSS has won the Deloitte’s Fast 50 India Award 2018. The award annually recognizes India’s faster growing and most dynamic technology businesses based on their percentage revenue growth over the past three financial years. CEDCOSS ranks #22 in the 50 big and small businesses that were recognized in an award ceremony organized by Deloitte India. What is Deloitte Fast 50 India program 2018? 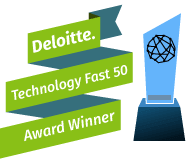 It is the 14th time in India, the Deloitte Technology Fast 50 program ranks fast-growing technology companies, public or private, based on percentage revenue growth over three years. There was a set criterion on which the whole Deloitte fast 50 Program was based. The nomination criteria below explains what it takes to be a winner. Devotes a significant proportion of operating revenues to research and development of technology. CEDCOSS is declared a winner for the 3rd time in a row with 22nd rank in Delloite fast 50 Program 2018 with the quest for doing innovation at every step. With 34th rank in 2016, we continued to rock on by maintaining the same elegance and dignity, securing the 22nd rank in 2018 with the average growth rate of the huge figure in all the 3 years. It is the third time, when we proved that, if you can dream it, you can do it. The company is regular making rapid strides in the E-Commerce MultiVendor/MarketPlace Platform, Digital Marketing Automation/Optimization, Mobile Solutions, AI/Bots arena and many other fields as well. With every new day, the quest for acquiring new proficiencies continues. Starting from taking requirements, searching deeply, experimenting, innovating, learning, persistently moving ahead with our sincere efforts and dedication, shaping the future, and challenging our capacities to create new opportunities, is a never-ending process in the company. The high level of confidence in CEDCOSS, its hearty products, and noteworthy client administrations contain the center of the development. It has empowered it to reinforce its hang on the business. Likewise, win the trust of thousands of new clients every month. We truly believe customers are the kings of the market. Thus, are more customers oriented than being product oriented. We are extremely happy to serve thousands of clients all over the world. We really want to thank all the clients who shared their wonderful experiences with us. No doubt, any company’s business growth depends upon the hard work of the employees. No individual can ever take the credit of all those years of success and hard work alone. Accomplishments of a company are the results of the combined efforts of every individual. This win is dedicated to the combined efforts of our subsidiaries CedCommerce, MakeWebBetter, BotMyWork, and MageNative. The Trophies and Awards in Recognition of the Hard Work and To Boost the Morale And Productivity. We are truly thankful to our investors, partners, suppliers, SMEs, and customers for their support and trust, which has led us to accomplish such an amazing feat for 3 years, continuously in a row. This award is a step forward in realizing our vision to digitize every aspect of e-commerce. We will continue to transform the unorganized manual efforts and develop solutions which will simplify the digital era which is going to knock our doors. We are respected to get such a famous honor, to the point that touts us as the quickest developing business in India. Going ahead, we wish to proceed with our yearning to wind up a worldwide B2B business organization and give hard time to our competitors. We promise our customers to bring loads of innovations for them in near future.